This post will focus on How to Learn English Speaking. I will tell you how you can learn to speak fluent English with a bit of practice and efforts. Friends, English Speaking have always been an issue with most of us. The reason is that most of us are from small cities and villages and have studied in Hindi Medium. Even students, who are living in big cities and are studying in English Medium, face difficulty when it comes to English Speaking. Another reason is lack of environment. English is not a natural language for us. Our natural language is Hindi or any regional language. To learn and speak English fluently a good environment is very much required. In this article I will tell you how you can create such environment and you can learn English speaking. 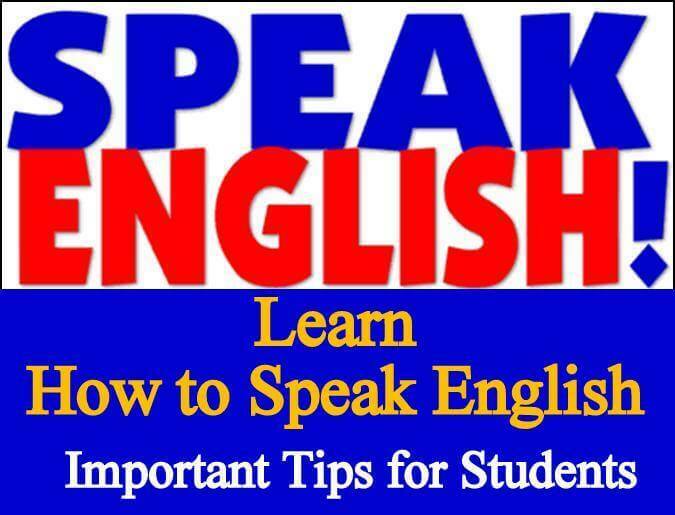 Before starting my tips on English Speaking I would like to share something with you. I would like to share my personal experience with all of you and how I learnt speaking fluent English. I have never joined any English speaking course still I am fluent English Speaking. Friends, I was born and brought up in a very small town and I have never studied in English medium school. I was a very ordinary student also and it is only somewhere during my graduation years I realized the importance of English Speaking. I always used to struggle when it comes to English speaking and due to hesitation I was not able to speak. This article I am writing so that you may not make the mistakes which I committed. We all should learn from our earlier experiences. I will share with you the methods which I had adopted for improving my English and you can also practice it. Today I am not only a good speaker but also have written more than 2000 articles on various topics for my various blogs. I am sharing this to make you realize that you can also become a fluent speaker with a bit of efforts. English speaking is very important in today’s world. Without good English it very difficult to get a good job and to progress in professional life. No matter how good a student you are it is vital for you to have fluent English. Why English is so important for Students? Understanding of good written as well as spoken English is very important for students. If you will ignore it you have to pay a heavy price. Whenever you will search for a good job you have to appear in personality tests such as interviews and Group discussions. It is expected that candidates show their communication skills as well as English speaking ability in these tests. English is also very important for getting admission into prestigious professional courses such as Engineering, MBA, MCA, Hotel Management etc. If you are planning to study in abroad you need to be fluent in English. Importance of English cannot be ruled out. Many people may argue that we are living in India and Hindi is our mother tongue. It is true that Hindi is very important but the fact of the matter is without good English it is not possible to get a good professional qualification or job. We have to live with this fact and rather than criticizing English language our focus should be to learn it as quickly as possible. Let me also tell you good knowledge of English and English Speaking is actually the key to success. I have seen many students who get very good jobs just because of their English speaking ability. Many ordinary students achieve great heights in their career just because of their English speaking ability. I am sure you must have also seen many such examples. Now-a-days it has become very important for all the students who are looking for a good career and for professionals who are looking for a faster career growth that they should be well versed in written as well as spoken English. How to learn speaking Effective English Speaking? Now the question is how one can learn speaking good English from his or her home. It is not necessary for you to join any English Speaking institute or waste your money on various online English Speaking courses. You can learn effective English Speaking very easily on your own. You do not need to spend any money on it. Only thing which is required is strong will power and ability to devote regular time for about 3 to 6 months. I can guarantee you that you can become a very fluent speaker from 3 to 6 months if you follow the tips suggested by me. I am so confident because I have practiced these tips and have learnt very good English. Once you develop a good English Speaking ability thereafter you can keep on improving with the time. Let us now discuss various tips and methods which I have adopted to improve my English. The tips given below are very practical, simple and effective. If you can follow these tips, I am sure that you can have very good command over Spoken English in 3 to 6 months. Range of 3 to 6 months I am giving as everyone has different level of grasping powers. It is also because everyone cannot devote the same level of time. The more time you devote the sooner you will learn. English News paper Reading: English Newspaper can help you a lot in many ways. It can help you to improve your English. It can improve your English in many ways. Newspaper is the best source for preparation. You should read two good Newspapers every day. Initially Times of India and Hindustan Times you can read. After 2-3 months you should also read papers such as The Hindu and Economic Times. Begin with Times of India as the English of Times of India is simple and you will find it easy to read. The level of English of Newspapers such as The Hindu and Economic Times is high. Newspapers are an effective medium simply because it can help you a lot to provide a good understanding of the English language. You can learn a lot of new words from the newspapers which you should note down and should try to use in day to day conversation. This will help you a lot to learn speaking English. Read newspaper everyday for about 1 hour. 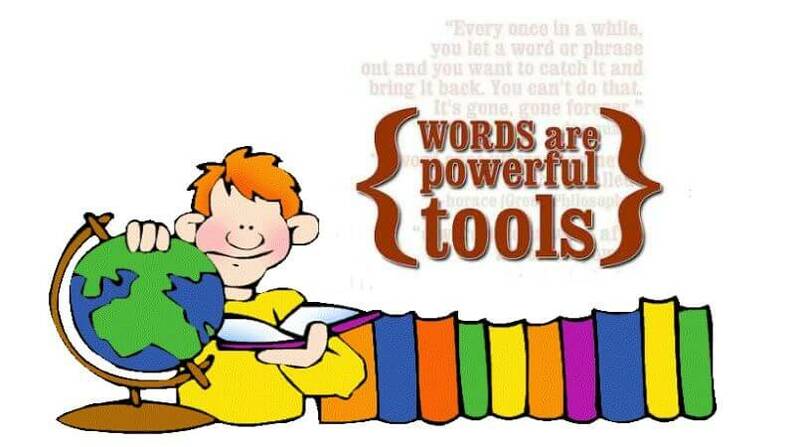 Highlight the important words and the words which are common and widely used. Check the meaning of these words from a good dictionary. Everyday try to learn at least 20-30 words. Maintain notes of these words so that you can keep on revising them. Also devote 10-15 minutes towards loud reading. Stand in front of mirror and read loudly from newspaper. Everyday 10-15 minutes practice of reading will help you to increase your pronunciation. It will also remove your hesitation. Pay attention towards structure of sentences. Regular reading will help you to build your grammar and your understanding will also improve. It will also improve your knowledge which will help in your competitive exams and interviews. So you can see that Newspaper can help you in many ways. It will help you to improve your vocabulary and grammar. It will also help you in improving speaking as well as pronunciation skills. Unfortunately most of us do not understand the value of it. If you utilize it properly it will be a great resource for you. I have used the Newspapers a lot and it has helped me to improve my English. Regular viewing of English News Channels and movies: Other great medium is Television and internet. You should regularly watch English News channels such as “Times Now” and “CNN”. You should make it a habit to regularly watch good News Channels as well as good English Movies and English Programs. Use YouTube effectively. Regularly watch programs which involve debates and discussion. Carefully watch how successful speaker are speaking. Note down the common sentences which are widely used. Also learn the methods and ways in which people speak. Follow the effective ways. Practice it in front of mirror. Remember to improve your English Speaking you can do most of the practice alone. Speaking in front of mirror and recording your sessions are the most effective ways. Do not be shy of English speaking: You should not feel shy while speaking English. If you are from a village or a small town you may find a few people making a mockery of you. You should not give importance to such things. Your aim should be to work on your mission of English Speaking. People will always say one thing or another. It should not shift your focus. The same people will appreciate you when you start speaking good English. Speak as much English as you can. Use it in your day to day to life. Speak it with your family and friends. The more you will speak the more fluent you will become. Also try to find a partner or group aiming for similar objective. With such people you can practice and discuss. When you practice in group and with a friend observe each other weakness also. Try to overcome each other weakness by giving feedback to each other. Such approach will surely help and improve your English. 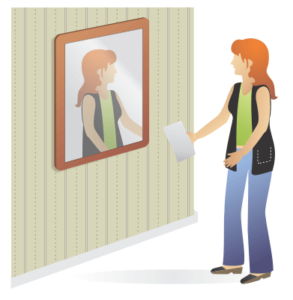 Speak in front of a Mirror: In the above paragraph I have talked about speaking in front of mirror. Speaking in front of a mirror is a very effective technique. It is very simple and anybody can easily do it. This is used widely all over the world and suggested by all experts. Speaking in front of mirror with direct eye contact will help you to boost your confidence and you can feel the change within a few days. You should regularly practice speaking English in front of a mirror till you attain a good level. There can be two methods of speaking before the mirror, first, you can take any topic from a book or newspaper and speak loudly. Try to speak as clear as you can, this will help you to speak comfortably and clearly in the longer runs. This will also improve your pronunciation skills. Second, you should not take any help from anywhere and try to speak on your own for about 10-15 minutes on whatever topic you like. Practice it and see drastic improvement in your Speaking English. 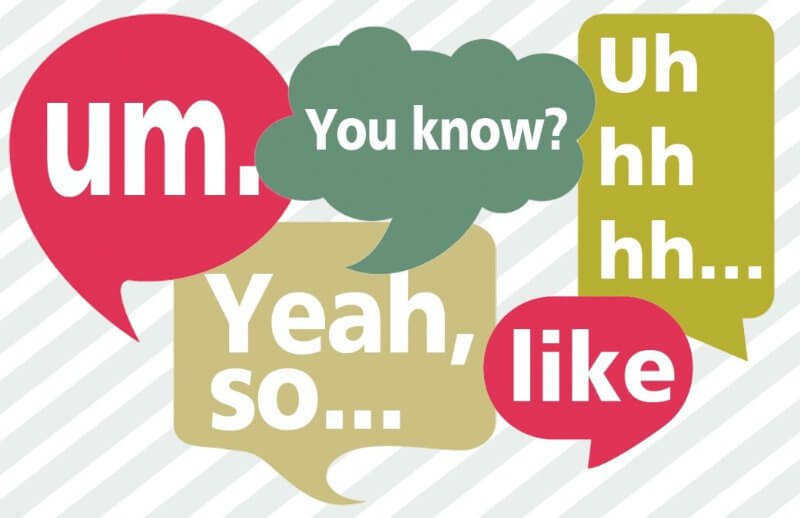 Good use of fillers: While speaking English do not worry when you do not get the right word or words, on such moments you can effectively use words such as “well” or “you know”. These words are known as fillers and these fillers will not only help you to take a pause but at the same time will provide you some time to recollect the right word. If you still find difficult to continue in English you can switch over to Hindi or your local language as the case may be. There is nothing wrong in mixing your language with English whenever you find it tough to get the right word. Improve your Grammar and Vocabulary: Along with the English speaking practice you should also keep on improving your grammar and vocabulary. You should study 10th level grammar books for improving your grammar. For improving your vocabulary you can follow the newspaper method which I suggested above. You can also purchase famous Word Power Book of Norman Lewis. Objective should be to improve as much as you can as far as English is concerned. If you practice this way your grammar, vocabulary, written as well as speaking English will improve. Conclusion: Therefore you can see that there are various ways through which you can improve your English Speaking. Unfortunately most of us keep on complaining. We give excuses such as I am from Hindi medium; I am from a village or small town. Rather than complaining I would like to tell you that with a little bit of will power and determination you can become a very good English Speaker. Those who already have good command can improve further by practicing in this manner. There is no need to waste your money on various coaching institutions on English Speaking as they will teach nothing new. If you have enough will power and desire to become a good speaker you can do it on your own by adopting the methods suggested above. A period of 3–6 months and 2–3 hours daily can change your life. If you have any query or you need any help from us, feel free to drop your comment. Thank u sir for to provide guideline HOW TO SPEAK ENGLISH FLUENTLY.